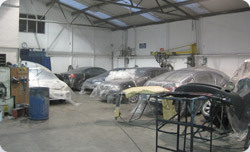 Crash repair specialists throughout Ireland. Have a look below and see what some of you happy customers have got to say about us. DHL is the global market leader in international express, overland transport and air freight. Our operation in Ireland is proud to be recognised as operating to the highest standards and we take great care in the presentation of our large fleet of delivery vehicles. Hence when any of our fleet needs repair we reply on Dennings to deliver a fast and efficient service to us at reasonable cost. "Like many businesses we occasionally find ourselves in the position where one of our own vehicles , or that of a third party , requires repair at our cost. the most efficient way to deal with problems of this nature is to repair the vehicle to a least the same condition that it was in pre accident. We reply on Dennings Cars to do this for us and following many years of co-operation we have absolutely no hesitation in recommending their service "
I recently dropped my car into Dennings to get some damage repaired on my door. Start to finish their staff were nothing but attentive and professional and i'm extremely happy with the outcome. I recently dropped my car into Dennings to get some damage repaired on my door. Start to finish their staff were nothing but attentive and professional and i’m extremely happy with the outcome.
" After going through a stressful time with the car, the service and excellent customer service in Dennings made it so much easier - highly recommend"
The overall work was amazing - I couldn't have asked for better. Emma was really helpful and has great customer service - would definitely recommend. © Dennings Cars 2019. All rights reserved.